Where Will We Go When The Lights Go Out? Kevin C. Borgia is a news and features writer for The Daily Vidette, the campus newspaper at Illinois State University in Normal, Illinois. 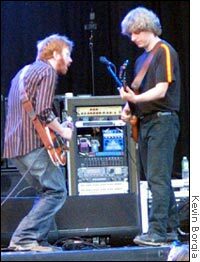 The author of over 190 articles, Kevin's recent stories have included a profile of Phish fans and an interview with billiards professional Scott Lee. A devoted Phishhead, Kevin documents his experience at one of Phish's final concerts at a remote airport in Vermont. Twenty-three year-old Ben Pomeroy and two friends left their home in Greenville, South Carolina, Friday morning on a road trip to see old friends. 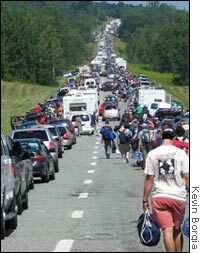 Twenty-two hours later, they joined the line on I-91 with thousands of others waiting to enter tiny Coventry, Vermont, where friends Trey, Page, Mike and Jon would be arriving soon. However, Ben and most of the masses had never even met the four men. They only knew them as the band Phish, who played their final shows last weekend. But tragedy seemed to befall Pomeroy when he heard the band's management was turning vehicles away due to torrential rains that rendered huge areas of the 600-acre concert site unusable. But after their 1000-mile journey, Pomeroy and friends wouldn't take "no" for an answer. They locked their car, grabbed all they could carry, and began the eight-hour hike into the campsite. Like the devoted heads of Woodstock in 1969, an endless stream of fans could not be deterred by rains and police warnings. They abandoned their cars and began hiking into the site as well. "No one's taking this away from me," said Pomeroy, who had already seen 67 Phish shows. "I just have to be here," he said through a tired smile. More than 70,000 fans made the trek to Coventry, and although most didn't have to hike in, their devotion was equally as intense, as many had previously traveled the nation on the heels of Phish. For them, Coventry was not only the end of a single road trip, but the end of an era, as the shows ended one of the most intriguing musical careers ever. Although they scored no mainstream "hits" nor had immense record sales, Phish's eclecticism and ever-changing set-lists have inspired thousands of Phish-heads to follow the band across the country. In a style similar to Deadheads, Phishheads like Pomeroy and me have logged thousands of hours on American roads in transit to and from Phish shows. The band was the reason we've learned to travel, often the sole reason we've visited areas of the country. The only reason I ever went to Maine, Vermont, New Hampshire, Miami, Ontario, and Quebec was because of Phish, and there are countless others like me. Along the way, we've filled the hotels, restaurants, campgrounds and stores of America, absorbing bits of the diverse culture we have in this country. We've learned about small towns with all their quirks, seen the beauty of small mountain communities and greeted many confused faces asking "you're from where?" We've spent endless hours navigating the Interstates, tired beyond belief, yet determined to make it to the next show. We've gone days without showers or civilized meals at a table, and we've saved our money and used our vacation time for the band. These actions may seem ridiculous, and they are. But in the end, we're sad to see it end. For us, Phish was one of the great American institutions. They've shown us the nation, they've been there as we grew up, and they've inspired us with musical epiphanies we never knew existed. And as the band closed the final show with "The Curtain," many eyes were filled with bittersweet tears, sad to see the end of an era, but still ecstatic to have been a part of something so special. Thank you Trey, Page, Mike and Jon.